On my recent boat excursion to Eastern Egg Rock in Maine, both luck and good timing were on my side. There, on this small, rocky island where puffins and terns nest, several razorbills sat on shore in full view. I have always wanted to see these sleek black and white puffin relatives, but because they breed on rocky cliffs in northeastern Canada, they are mostly spotted in winter or when migrating. The razorbill sighting alone would have made for a great day on the water, when we spied a common murre—another bird in the auk family that I had never seen—swimming nearby. Moments later, a fantastic northern gannet careened overhead, circled twice, and flew off out of view. The triple header made watching puffins seem almost ordinary. And, as you can see from my sketch, the poor black guillemot, the most common auk species in Maine, didn’t even make the page. 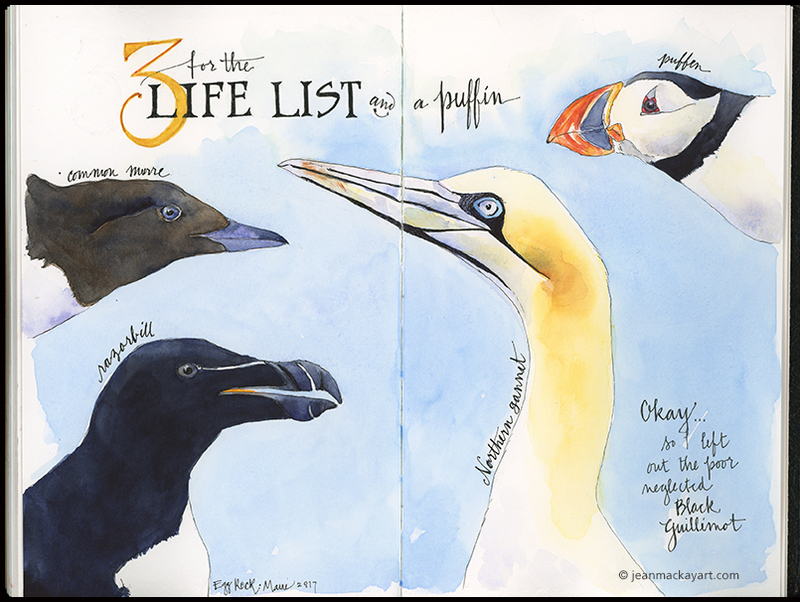 This entry was posted in Birds, Journal, Watercolor and tagged Atlantic Puffin, coast, Hog Island Audubon Camp, natural history illustration, nature, northern gannet, razorbill by Jean Mackay / Drawn In. Bookmark the permalink. Excellent. (Can’t believe you hadn’t seen those before on your previous trips to Hog Island.) Think that the Razorbill and the Northern Gannet are among the most beautiful birds in North America. I know, Beth…but I suspect I have been there too late in the season. Other groups have seen razorbills, but I’ve always missed them. The Northern Gannet was quite spectacular! Beautiful page!! And how exciting – I would love to see a Puffin, but a huge raft of Surf Scoters was pretty fantastic too! Yes…it’s fun to see all of them…scoters, eiders with chicks, gulls, terns, auks, herons, osprey, eagles, etc! Wow! What amazing and detailed illustrations. I am so happy that I stumbled across your blog. I shall look forward to following your work :). Hi– Glad you found your way here, too. Thanks for leaving such positive comments. I have been to NZ and the UK years ago and have a fondness for both. Visited before I was really interested in birds, so missed a lot– though I did learn some birds in NZ since there are so many endemic species there. Cheers! That must have been so exiting! I’ve never seen any of them – maybe a murre, from a ferry, without realizing it. 😉 And we see guillemots over here from ferries as well. I have always loved pictures of gannets – they are so stylized looking around the beak, eye and head. I bet you enjoyed drawing that one. I enjoyed seeing it and painting it! I love that subtle yellow on the face and neck. It was a great day! Hope you get to see one someday. I spent two weeks on Hog Island the year the puffins were ‘scheduled’ to return to land after their reintroduction. This was back in 1977 or 78…. LOVED the coast of Maine. And love your paintings of the birds. Thank you for sharing. Wow– that was a moment in time. All expectation, trepidation, hope for Project Puffin. You would enjoy reading “Project Puffin” by Steve Kress and Derrick Jackson. It is a fascinating account of Steve’s adventures to reintroduce puffins. Steve is still going strong and Hog Island is better than ever!